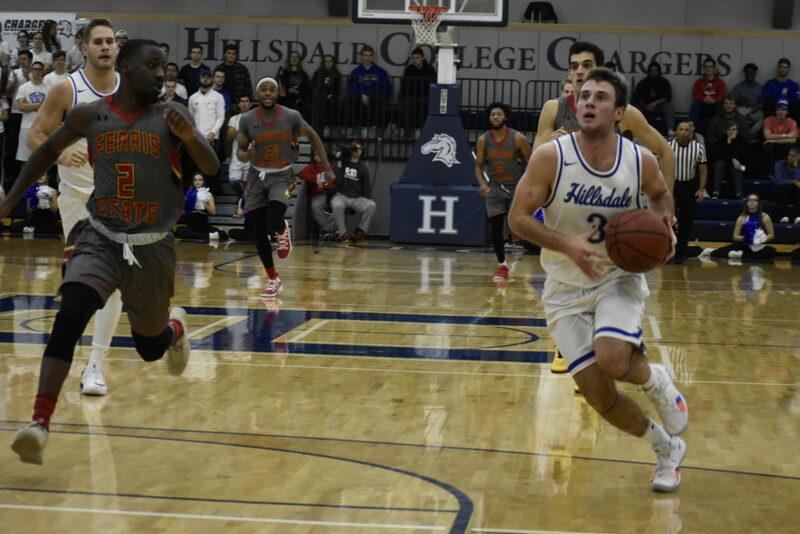 The Hillsdale Chargers hosted last year’s NCAA Division II National Cham­pions, the Ferris State Uni­versity Bulldogs on Nov. 15. Senior forward Gordon Behr said the Chargers always play Ferris State tight. That didn’t change this season. After trailing 37 – 24 at the half, the Chargers took the court deter­mined. The Chargers were out­re­bounded 19 – 13 in the first half, but they came back in the second with 15 rebounds to the Bulldogs’ nine. A three-pointer by Neveau started it all, as the Chargers closed the deficit to single digits, 57 – 48 with 9:57 to go. With about eight minutes left, the Chargers went on a scoring run of their own, beginning with two made free throws by Behr. Behr snagged a rebound on the next play, getting the ball up the court to junior guard Dylan Lowry, who was fouled. It was his turn to score two more points, and he brought the Chargers within six points, 61 – 55. Both teams made a couple of trips up and down the court with no avail, but sophomore forward Davis Larson grabbed a rebound on Ferris State’s end of the court, got the ball to Lowry, who earned the assist when Behr made a layup. The play seemed to be repeated, but this time it was senior center Czarnowski who grabbed the rebound and put the ball in the guard’s hands. Neveau passed back to Czarnowski under the basket for a Hillsdale layup. The Chargers were only two points away, forcing the Bulldogs to call timeout with six minutes left in the game. A minute passed without scoring on either end until Larson got the ball and passed to Czarnowksi for another layup to tie the game at 61. The Chargers had scored 10 points in three minutes while holding the Bulldogs to zero. As the clock wound down, Ferris took back its lead. With one minute left in the game, they earned a five-point lead at 70 – 65. Lowry shot two free throws to bring Hillsdale within three points. Free throws kept the Chargers in the game. They outshot Ferris 90.5 to 41.7 percent, however, this was not enough to give the Chargers the victory. Ferris ended the game with one more shot to take the win, 72 – 67. The teams tied in rebounding, and Ferris led field goal per­centage, but not by much, as they shot 46.8 percent to Hillsdale’s 43.1. Dylan Lowry led the Chargers in scoring with 15 points, six of which came from his free throws. Five shot 100 percent from the free-throw line, shooting at least two. Czarnowski and Neveau each added 13 points as well. Neveau’s speed and aggres­siveness earned him 10 rebounds, the most of any Charger. On Nov. 20 and 21, the Chargers played in the home Thanks­giving Classic tour­nament. They first took on the Uni­versity of Wis­consin-Parkside Rangers. They fin­ished with a 53 – 44 victory. The Northern Michigan Wildcats were next on the schedule. They outshot the Chargers 55.3 to 48.2 percent for a 80 – 68 victory. 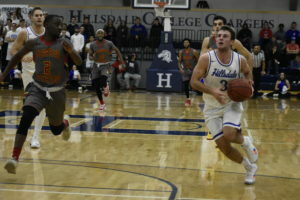 Then on Sunday Hillsdale hosted a close game against Saginaw Valley State Uni­versity. The Chargers, who were missing the strength of two of their senior starters, fell to the Car­dinals 70 – 65. Czarnowski who has been dealing with an achilles injury all season was wearing a boot on the side­lines. Neveau only saw the court for 18 minutes due to a thumb injury. He usually averages nearly 36 minutes. The Car­dinals went to the free throw line 22 times in the second half, making 17 of them. 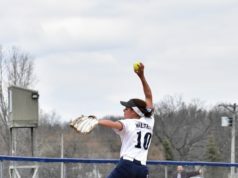 These non-con­ference games are important for Hillsdale as it pre­pares the team for the post­season. Each of the teams the Chargers played last week are potential regional oppo­nents. This year’s Midwest region is made up of the G-MAC, the GLIAC and the GLVC. “We want to show that our league is com­pa­rable,” Neveau said. The Chargers begin con­ference play tonight at 7:45 p.m. as they take on the Yellow Jackets at Cedarville Uni­versity. Cedarville is 2 – 3 this season. Choiniere said the Yellow Jackets always draw a big crowd but the Chargers are excited. On Sat­urday the Chargers will travel to Tiffin, Ohio, to play the Dragons at 3 p.m. Tiffin is also 2 – 3 this season. Hillsdale out­ranked both Cedarville and Tiffin in the G-MAC pre­season coaches poll. 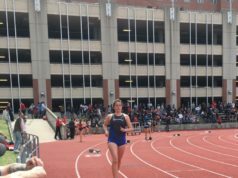 Out of 13 schools, Hillsdale was ranked second, while Cedarville was seventh and Tiffin was voted ninth. Behr said the team is looking forward to con­ference play. Hillsdale won both of its games against Cedarville last season but didn’t play Tiffin.